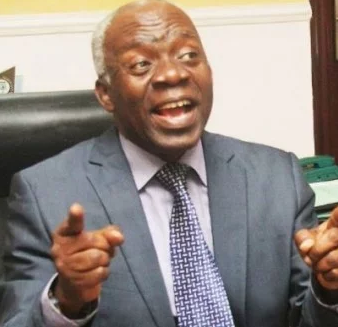 Nigerian Lawyer and human rights activist, Femi Falana has just written an interesting piece on how to end the lingering violent clashes between farmers and herdsmen in Nigeria. Following the tragic killing of 73 people during the violent attack on Logo and Guma in Benue State January 1, 2018, Chief Paul Unongo, a former minister had accused former Vice President Atiku Abubakar of masterminding the crisis since he is a patron of Miyetti Allah Cattle Breeders Association. Although Alhaji Abubakar promptly denied the allegation and threatened to institute a libel suit in court the governors of Nasarawa and Plateau states, Governors Tanko Al-Makura and Simon Lalong respectively, have publicly blamed their Benue state colleague, Governor Samuel Ortom for the tragic killing. As far as both governors are concerned, it was the enactment of the Open Grazing Prohibition Law of Benue state which provoked the violent attack. But the two chief executives did not explain the basis of the reckless killing of farmers in Benue state before the enactment of the law or the incessant killing of hundreds of farmers by herdsmen in other states of the federation. In fact, after the Benue incident, not less than 10 people have been killed by herdsmen in Kaduna state. Apart from the fact that Kaduna state has no anti grazing law Governor Nasir El-Rufai once announced that he had paid an undisclosed sum of money to the herdsmen to stop further killing of unarmed farmers in the state! Even Governor Ortom has not been left out of the blame game. In his presentation to the visiting Senate Ad Hoc Committee on Security the governor said that the authorities in Abuja should be held liable for the crisis for ignoring several warnings of the impending attack. However, upon realizing the futility of blaming the Benue state government over the tragic incident, Governor Lalong has displayed maturity by apologizing for his comments. But in his reaction to the tragic incident in Benue State, the Emir of Kano, Alhaji Sanusi Lamido Sanusi and Patron of Miyeti Allah alleged that over 800 Fulani people were brutally killed by ethnic militias in Taraba state in one weekend last year. In denying the allegation the Taraba state government has said that in the violent clash which occurred between the Fulani and Mambilla people in Sadauna last year “both sides suffered casualties and the figure of death from both sides put together was nothing close to genocide.” With respect, the revered Emir ought not to have waited for the killing of 73 people in Benue state before crying out over what he has described as “these acts of ethnic cleansing” by some influential people in Taraba state. We ought to have built a nation whereby the killing of every citizen is viewed as an assault on our collective humanity. On that note, the Taraba state government and the Nigeria Police Force should ensure the prosecution of all persons indicted by the Justice Nuhu Adi commission of inquiry which investigated the crisis and has since submitted its report to Governor Darius Ishiaku. However, in moments of ethno-religious crises, traditional rulers, political office holders and religious leaders and should desist from making inflammatory statements which are capable of aggravating violence in the society. It is high time the political elite stopped the practice of blaming the victims of injustice in the land. Since the federal government has a legal duty to protect the life and property of every citizen it has failed to put an end to the perennial violent conflicts between farmers and cattle herdsmen which have needlessly claimed many lives and destruction of properties worth several billions of Naira in many states of the federation. The official negligence of the federal government cannot be justified because, as far back as May 2016, the authorities in Abuja had rightly decided to establish ranches in line with modern practice in civilized countries. The plan was announced by the Minister of Agriculture and Natural Resources, Chief Audu Ogbe at a public hearing organized by the Senate Committees on Agriculture, and National Security and Intelligence on May 3, 2016. On that occasion, the Minister of State, Agriculture, Honourable Heineken Lokpobiri, who represented Chief Audu Ogbe said that as a result of climate change resulting from global warming and desertification, herdsmen had no option than to migrate southwards to find pastures for their animals, which now faced starvation in the North. Mr. Lokpobiri pointed out that nomadic cattle rearing had become obsolete and this was why ranches were a necessity to provide adequate food to the cattle and forestall unnecessary clashes. He further said that with ranches, the livestock would be healthier, more productive, while the herdsmen would avoid unnecessary attacks and would also be able to give their children opportunity to be educated. Having decided to establish ranches the federal government announced that it was determined to disarm the herdsmen. The decision had been announced by the Agriculture Minister, Chief Ogbe in an extensive interview published in the May 4, 2016 edition of the Vanguard newspaper when he said that “The army, the police should find them wherever they are now and take the guns from them as the first step. They carry AK47s on the necks, they tie them around the bellies of the cows, they must be disarmed immediately. But since the federal government has neither established the ranches not disarmed the herdsmen the reign of terror has continued in Benue, Taraba and many other states. Instead of apologizing to the nation for such official negligence the federal government has turned round to compound the crisis by announcing the decision to drop ranches for cattle colonies. Since the volte face is based on the objection of a few powerful cattle owners the federal government has been accused of insincerity in addressing the crisis. But the federal government is merely playing on words as there is no difference between ranches and cattle colonies. In fact, the arguments of Chief Ogbe for ranches and cattle colonies are the same. In defending the new policy, Chief Ogbe said that “The federal government is planning a programme called cattle colonies, not ranches but colonies, where at least 5000 hectares of land would be made available, adequate water and adequate pasture would be made available. We also want to stop cattle from roaming the streets, farms and other areas as they will henceforth be provided with water and adequate security by the rangers, adequate pasture milk collection and even security against rustlers to enable them live normal life. This has been successfully done in India, Ethiopia and even Brazil.” What Chief Ogbe did not say is that cattle colonies are called ranches in India, Ethiopia and Brazil! However, until the Miyetti Allah recently announced that it had decided to launch reprisal attacks in Benue and other states wherever the Fulani people are attacked the federal government had given the impression that the armed herdsmen were nationals of Senegal, Mali, Niger and Libya. But whether the herdsmen are Nigerians or foreigners it is indisputable, as Professor Biodun Jeyifo has observed, that this is the first time in the history of Nigeria that any armed group has been allowed to possess arms and ammunition and attack law abiding citizens without any challenge from the neo-colonial State. Of course, the Buhari regime is right in saying that the herdsmen were not disarmed by previous regimes. But having crushed other armed groups in the country the Buhari administration cannot justify the decision to treat the armed herdsmen like sacred cows. Therefore, it is high time the armed herdsmen were disarmed by the federal government. At the same time, the much delayed ranches should be established while all feuding communities are reconciled. With ranches and abattoirs established in a few states, meat would be prepared in large scale and distributed throughout the country and possibly exported. That is what has been done in Botswana which is the largest producer and exporter of meat in Africa. That southern African country of 2.2 million people with a cattle population of over 3 million has successfully stopped violent clashes between farmers and cattle herdsmen. Once ranches and abattoirs are established in Nigeria, all controversial anti grazing laws would become spent while Governor Ayo Fayose would not have any basis to risk the lives of the hunters in Ekiti state by mobilizing and equipping them with local guns to confront AK 47-bearing herdsmen!